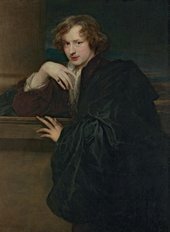 Sir Anthony van Dyck (Dutch pronunciation: [vɑn ˈdɛi̯k], many variant spellings; 22 March 1599 – 9 December 1641) was a Flemish Baroque artist who became the leading court painter in England after success in the Southern Netherlands and Italy. 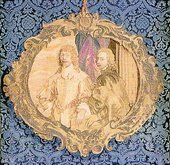 The seventh child of Frans van Dyck, a wealthy Antwerp silk merchant, Anthony was precocious as a youth and painted from an early age. In his late teens he was already enjoying success as an independent painter, becoming a master in the Antwerp guild in 1618. By this time he was working in the studio of the leading northern painter of the day, Peter Paul Rubens, who became a major influence on his work. Van Dyck worked in London for some months in 1621, then returned to Flanders for a brief time, before travelling to Italy, where he stayed until 1627, mostly based in Genoa. In the late 1620s he completed his greatly admired Iconography series of portrait etchings, mostly of other artists. He spent five years after his return from Italy in Flanders, and from 1630 was court painter for the archduchess Isabella, Habsburg Governor of Flanders. In 1632 he returned to London to be the main court painter, at the request of Charles I of England. With the exception of Holbein, van Dyck and his contemporary Diego Velázquez were the first painters of pre-eminent talent to work mainly as court portraitists, revolutionising the genre. 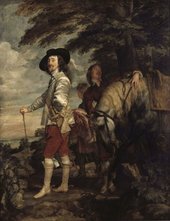 He is best known for his portraits of European aristocracy, most notably Charles I and his family and associates; Van Dyck became the dominant influence on English portrait-painting for the next 150 years. He also painted mythological and biblical subjects, including altarpieces, displayed outstanding facility as a draughtsman, and was an important innovator in watercolour and etching. His superb brushwork, apparently rather quickly painted, can usually be distinguished from the large areas painted by his many assistants. His portrait style changed considerably between the different countries he worked in, culminating in the relaxed elegance of his last English period. His influence extends into the modern period; the Van Dyke beard is named after him. During his lifetime, Charles I granted him a knighthood, and he was buried in St Paul's Cathedral, an indication of his standing at the time of his death.